In an interview, Federal Reserve Bank of St. Louis President James Bullard said it was “reasonable” to expect the central bank would slowly begin to unwind its easy-money policies before the end of the year. With interest rates close to zero for more than two years some Central Bankers get nervous. It appears they are not working, and they hate to give that impression to the public. He (and others) must be delusional, after being too long in the “zero interest rate desert” with no water. President Bullard: Please tell us where the “inflation that makes you nervous” can be seen. 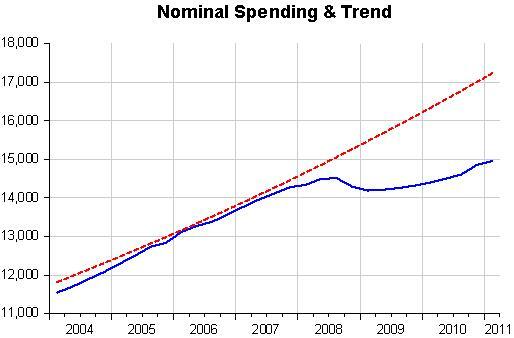 First: nominal spending is way below “trend level”. 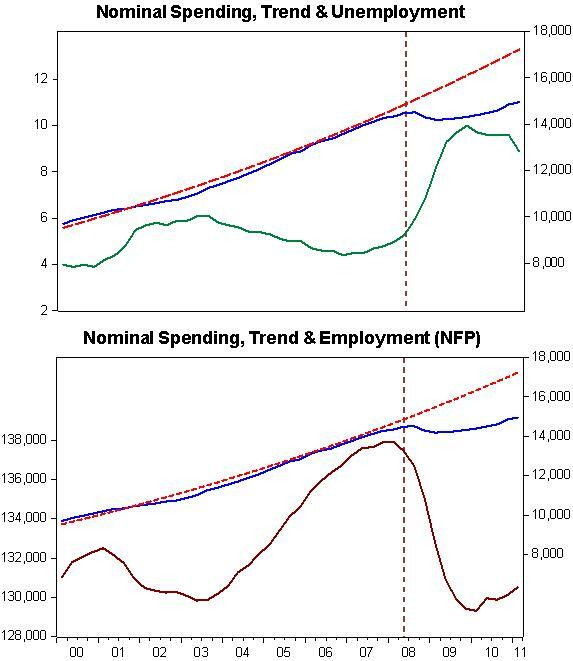 Second: nominal spending growth is anemic – actually distancing spending from trend level. Compare that with the exit from the 1981-82 recession. 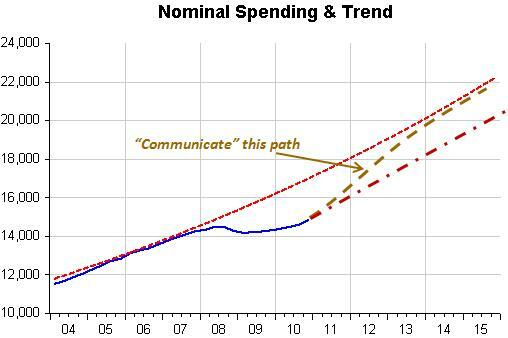 Even though at that time nominal spending didn´t fall “off a cliff”, spending growth was robust thereafter. 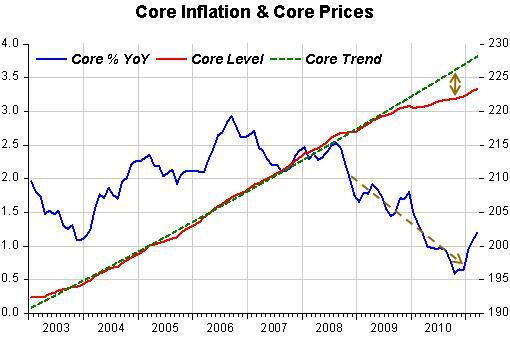 And where did “core” inflation go? Down! 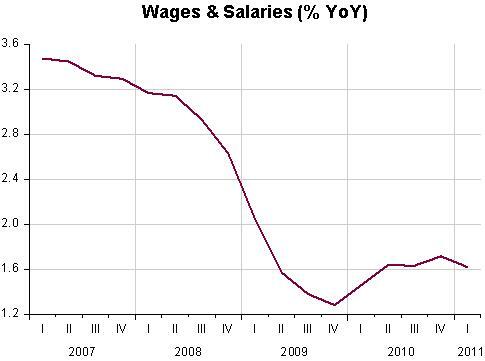 Third: What´s going on with wages & salary growth? Went down and stayed down. What about the employment situation? A “catastrophe”! So please, Mr. Bullard: “Come again”? That´s the logical conclusion from Bernanke´s answers to badly framed questions. The inflation-unemployment nexus is a bad and even dangerous guide to policy. But it´s how the “stabilization” question is framed and acted upon. 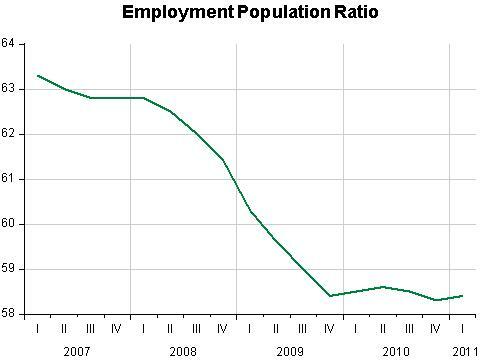 Since both housing and unemployment have not recovered sufficiently, why are you not instantly embarking on QE3? The impact of LSAP programs on economic activity depends on the programs’ effects on longer-term interest rates and the responsiveness of aggregate demand to such changes. 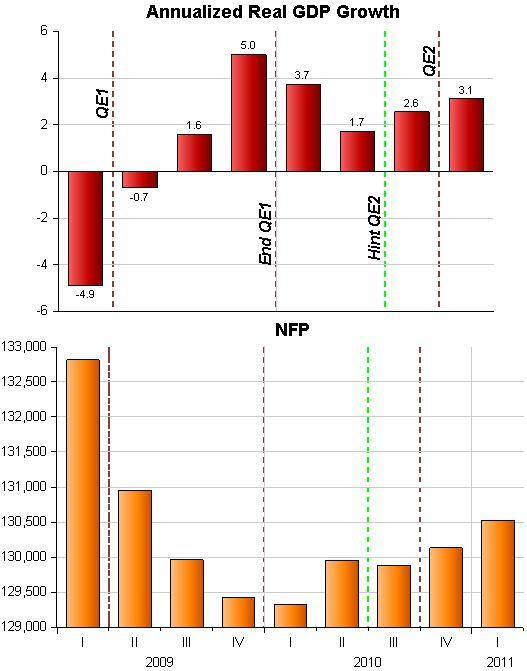 A less-recognized risk in LSAP programs is that permanent increases in the monetary base foreshadow eventual increases in inflation that can increase, rather than reduce, unemployment over the long term. Funny that that long term interest rates went UP after QE2! But as Scott Sumner never tires of saying: both interest rates and the monetary base are not good indicators of the stance of monetary policy. And monetary policy is (still) tight because money demand has risen more than money supply. Back in 2008, by giving too much attention to a noisy measure of inflation, the Fed was responsible for the aggregate nominal spending meltdown, one not seen since the 1930´s. The economy fell into a deep hole and is not getting out of it because the Fed refuses to “light up the way” by showing “where it wants to go”. The nice thing about such an action – defining a target level – is that if the Fed has credibility (a big if given the prevailing “modes of thought”) very quickly the “market” will get ahead of the Fed so that very little “prodding” by the Fed will actually be necessary. But alas, no. 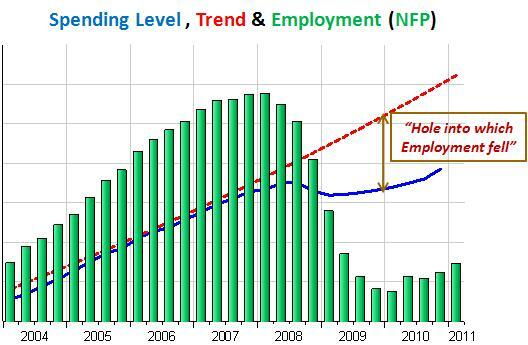 We will probably continue to “reside” well inside the “hole” (with unemployment high/employment low) because the Fed´s “flashlight” is out of batteries! As Scott reminds me via e-mail: “I just noticed that the last time NGDP growth reached 5% was 2007:4. Nearly two years of “recovery,” and not a single quarter of trend growth in NGDP. And Bernanke mentioned that faster growth threatened inflation”. QE2 will end as planned in June. Monetary policy will “passively tighten”. In the Press Conference Bernanke fretted about core inflation going up, about the danger of rising commodity and oil prices and about inflation expectations – up but still anchored. The “hawks” are in control. There was unanimity but Bernanke conceded their points! To him, it´s a pity long term unemployment continues elevated, but the inflation “dangers” take precedence! But that’s problematic for the Fed. It will be much easier for people, inside the Federal Open Market Committee and out, to argue that the benefits to additional expansion are smaller than believed and since the economy has improved meaningfully from last summer, there’s less pressure to act in the first place. The Fed chose a direction rather than a destination, and when its action left it short of the destination, it opened the door to criticism that the direction was wrong, when in fact it may simply have traveled an insufficient distance (perhaps thanks to unexpected headwinds). If you target a destination, you don’t run into that problem. I´m more radical and think it has traveled no distance at all, it just stopped the “nose dive” as the two pictures below attest. Please Mr. Bernanke, at least in 1999 you suggested Japan adopt a “Price Level Target”. You could do even better and adopt a “Nominal Spending Level Target”. 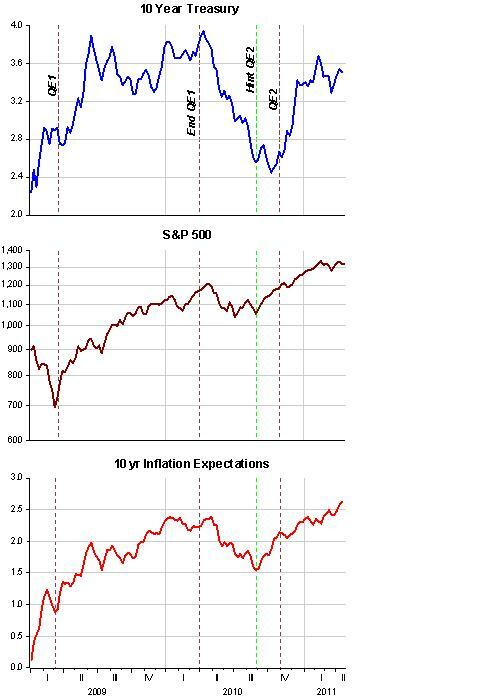 Let “market conditions” determine how that will be divided up between real growth and inflation. 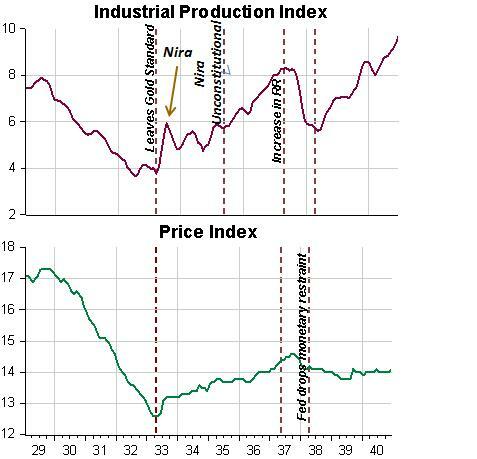 If the 1933-37 period is a useful guide, real growth will rule the day. Otherwise you will be repeating the Eccles Fed mistake, which in 1937 raised required reserves because inflation was “rising”! Update: Ezra Klein on what Bernanke should have said! — Q&A on April 14 at the International Factoring Association Conference in Washington, D.C. (Reuters). As the Fed’s policy-making board prepares to meet Tuesday and Wednesday — after which the Fed chairman, Ben S. Bernanke, will hold a news conference for the first time to explain its decisions to the public — a broad range of economists say that the disappointing results show the limits of the central bank’s ability to lift the nation from its economic malaise. What QE2 might have done — and probably did do for a while — is act as a signal of the Fed’s determination to do whatever is necessary, and maybe of a willingness to accept higher inflation. But this only goes so far, especially with all the political pressure on the Fed and its constant declarations, in the face of that pressure, that it remains as steadfast against inflation as ever. The problem with the QEs all along is that they have been rather ad-hoc and unpredictable. This has made them less effective and politically polarizing. Imagine how different the Fed’s monetary stimulus would have been had they adopted an explicit target, preferably a nominal GDP level target. Such an approach would have given them the freedom to do really aggressive ‘catch-up’ monetary easing until nominal GDP returned to the targeted trend while at the same time ensuring long-term predictability. It also would be viewed (correctly) as constraining the Fed’s power. Krugman and Ritholtz say the “conservatives” should not be hysterical about the dollar decline. That´s true, but Krugman doesn´t miss the chance to point out that the “dollar debasement” was not the work of Obama. Guess who´s behind it? The figure below shows the whole history of the dollar trade weighted exchange rate against a broad basket of currencies since the flexible rate system began in 1973, both in nominal and real terms. Up to the mid 1990´s the dollar appreciated almost continuously in nominal terms. That´s because until that point in time many important emerging market trade partners had high inflation (and devalued accordingly). Since then, with inflation low almost everywhere, the nominal and real exchange rates move in tandem. Notice the long cyclical swings in the real rate, which have nothing to do with specific presidents or political parties. Maybe now the real exchange rate will break through the long standing “support level” of something close to 80. But who knows? And the graph on government revenues as a percent of GDP follows. Sure, the US has a relative low tax ratio. So what? Decades ago Friedman taught us that the share or weight of government in the economy is measured by the level of its expenditures as a share of GDP. Taxes are just the means through which government supports its “weight”. The figure below shows that what Krugman in effect is advocating is that the US government “perpetuates” its higher share of the economy by raising taxes. Not long ago, in 2000, US government expenditures were “only” 33.9% of GDP while revenues were 35.4%. In 2007 expenditures were up to 36.8 with revenue dropping to 34%. Don´t say taxes are “low”; say you want a larger role for government. It´s more honest! The symptoms of Eurozone malaise are very visible, well summarized in this graphics from the Financial Times. Less visible but fundamental to the euro survival are the political undercurrents that have begun to manifest themselves all over the “zone”. The most recent and potentially the most damaging is the April 17 election result in Finland, where the True Finns party that until then had only 4% of parliamentary seats jumped to 19.0%, coming in third, close on the heels of the Conservatives (20.4%) and the Social Democrats (19.1%). With their strong election performance, the True Finns could disrupt ongoing efforts (read bailouts) to tackle the euro debt crisis because in Finland the parliament has to approve the country´s participation in the bailouts of member countries and EU rules require unanimous approval for each euro bailout fund. Finland is special because of its recent history. In the early 1990´s Finland had went through a “Great Recession”. Between 1990 and 1993 real growth was significantly negative and unemployment reached almost 17% in 1994. Since 1995, Finland stabilized its economy with nominal spending evolving close to a 5% stable trend level growth path until the crisis hit. Among Eurozone countries Finland is also an exception in that it has remained within the Maastricht deficit and debt limits of 3% and 60% respectively. Naturally, the Finns must be thinking: If we managed to do it on our own, why shouldn´t Portugal, Greece and others do it also? It hasn´t helped at all that euro governments went all out to save their banks at the expense of taxpayers. Even “save” is the wrong word since according to Tyler Cowen, many of the Eurozone countries are moving “toward a land inhabited by zombie banks”. The result is that now the crisis is generating a political backlash – a revolt of the taxpayers – that extends from the “northern periphery” to both the large and small euro economies. Bets on the outcome are wide open. But it is almost certain the statu quo will not survive. I have one more “nail to put in Bernanke´s coffin”. I´ve already told the story of how he “chickened out” simply by not doing what back in 1999 he advised Japan to do to try and get out of its “hole” (see “Japanese Monetary Policy…” on the Suggested Reading list). For many years, even before becoming associated with the Fed, first as governor and later as its Chairman, he went on and on about the importance of “communication”, or how the Fed shouldn´t “surprise” markets (see “What happens when Greenspan is gone” on the Suggested Reading list). When the rate-setting Federal Open Market Committee meets on April 27, it is unlikely to limit its options by ruling out asset purchases beyond the second $600bn “quantitative easing” programme – or “QE2” – that is due to finish by the end of the second quarter. Fed officials, however, know that announcing more asset purchases at the last minute would disrupt markets. Silence on a follow-up “QE3” at next week’s meeting would therefore signal that their current intention is to complete the $600bn QE2 programme and then stop. The original monetary induced crisis is not being resolved and the derivative fiscal crisis is “ballooning”. So no surprise that the S&P has downgraded the US outlook from stable to negative.